Put the world on your wrist with Motorola's 2nd Gen Moto 360 Smartwatch. 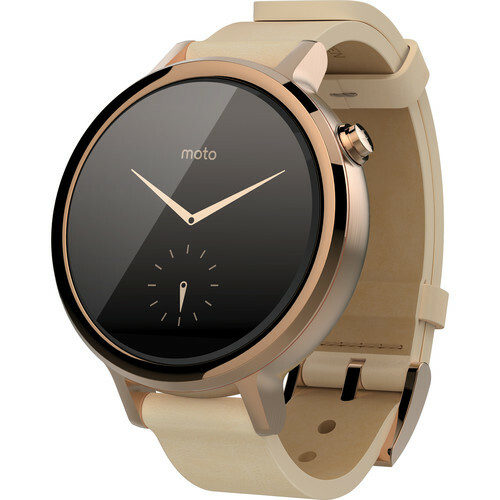 This women's 42mm watch comes in rose gold with a rose gold chamfered bezel and a Blush Horween leather band and runs on the Android Wear operating system. It connects to your Android or iOS smartphone via Bluetooth to give you the information you need when you need it and displays it before you ask. Box Dimensions (LxWxH) 6.3 x 6.1 x 3.8"
2nd Gen Moto 360 42mm Women's Smartwatch (Rose Gold, Blush Leather Band) is rated 4.3 out of 5 by 7. Rated 4 out of 5 by shelcassb from Great wearable tech This watch looks and feels very high end. The rose gold and blush leather are very nice together. The tech functionality is great. Works very well with Android/Google devices. Would not recommend for Apple as you lose a lot of functionality with them. The only improvments I hope they make are the ability to have the full social media apps on the watch. You can get notifications of facebook messages, tweets, intstagram, but would be even better to be able to scroll through those apps from the watch. Also the ability to actually answer calls and talk through it like you can with Gear and Apple Watch. But it is truly a great choice with great voice recognition for texting and other apps. Rated 4 out of 5 by Anonymous from Love the watch so far I had the watch for one week and it works great so far. It charge at good speed and the battery last more than a day. It is a drawback not having a speaker. It will be great if it has one with the new release of Anroid wear. All in all, it is a beauty watch and everything works as I expected. Rated 4 out of 5 by Anonymous from very good smart watch the best looking smart watch in the market big screen battery is good cool charging cradle. Rated 4 out of 5 by Moto360Fan from FitBit to Moto: iPhone User Note: I am an iPhone user. As a medical professional, it's great to have finally have a fitness tracker that I can wear to work and still take vitals. I enjoy the info cards, but it does not provide the syncronization nor the detail to which I was accustomed with the fitbit app. Because Moto needs to be charged every night, I can no longer track my sleep patterns, but I love the ease of wireless charging. Rated 5 out of 5 by MR_KA3KA3 from It works, But not in love with it. I like the looks, battery life is good. I like the features it offers but I wish it had a speaker to make phone calls. Can it use for men?? Yes, this watch can be worn by anyone. Dis item can be use for men also??? Yes, This watch could be used by anyone. Do you receive incoming call notification? It will display incoming calls.